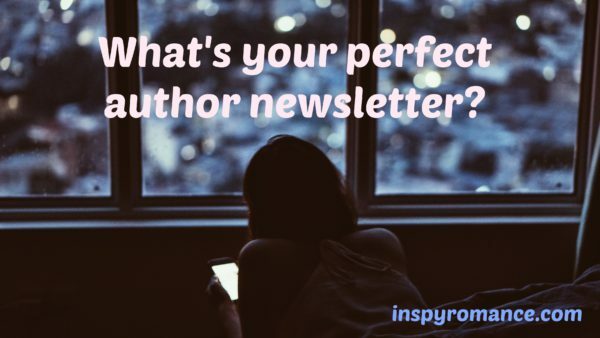 What’s Your Perfect Author Newsletter? I love getting author newsletters. Actually, I love getting behind-the-scene peaks into the lives and writing careers of my favorite authors. When their name or their entertaining newsletters pop up in my inbox, I am all over it. New book releasing? YES!! Hold everything while I go order it. Tidbits on what’s been going on in the author’s life? Yay! This will be a fun couple minutes. Sneak peeks on how a cover was made? I am sharing that one all over the place. But I’m a writer. This stuff should interest me, right? That’s something I always struggle with — how does what I like as a writer compare to what you readers like? Would you all be willing to help me — and the rest of us Inspy Romance authors — today? What do you like to get from your favorite authors? What do you want to see in their newsletters? What do you wish they’d do more of? Or less of? The newsletters that you open right away… what’s in them? What’s hooked you? Thank you all for sharing this information! I’m really looking forward to hearing your comments and talking with you about them in the comments. Loved this, Wemble! Thank you! FYI :), I am struggling a bit with this next book, but at the same time it’s coming and I’m super excited about it! Off to get today’s word count in in a few moments. So I’m curious–what books do you reread? I have a few that I pick up again every so often. Hi Sally. I enjoy receiving author’s newsletter, but often only have time to skim them. First, layout is important – font size and white background with black font is a must for these older eyes. Then length – shorter is better with some interesting pictures. I do enjoy behind the scenes stories about the author’s research for a book. As a retired English and creative writing high school teacher, I also enjoy reading about the creative process of writing and book production, for example how covers are created. Reading about new releases and pre-orders helps me schedule my reading time in between family obligations and watching 4 grandchildren. Personally, while I enjoy a book blurb in the newsletter, I skip reading book excerpts. I prefer to read the book in its entirety. Through newsletters I realize that authors receive rights for previously published books and then republish them with a new cover or in a new boxed set. Please let the reader know, especially boxed sets. I purchased several in the last year and then realized I have already read the story (this was not necessarily Inspy Romance authors). I have a pretty good memory. Best wishes. Happy writing. Thanks for the insight. That was all great. Great question. I’m following with interest. I know I like short. If I see it too long – I just delete. I guess I like authors’ newsletters to sound like the posts we have here: tell me about new books always, sneak peeks appreciated, let me into the writing process (story, cover…), and tell me a bit about yourself. I usually like when there’s a little bit of everything nicely separated with titles, pictures … but I’ll read a long one if I have time, usually I skim the long ones and if they pick my interest, I’ll slow down. Video chat was never something I was really into.. The only time I actually tried was when InspyRomance was doing it and the system didn’t work for me the one night I didn’t have to teach. Although it’s nice to hear the author, It’s really nice to be able to go through what’s new when I find time. Btw, I’d actually love to have time to actually chat with authors. Sounds really fun. Thanks for this, Priscila. So you’re really more about talking to authors in person, right? Yes. I’d love video chats (or in person chats), but fear they have to be scheduled during times that work for most people and it’d be really hard to make time. I don’t have much to add after reading the other comments. I have enjoyed all the author newsletters i receive, and they are all different. Pictures are fun. It is fun seeing how every author has their own style. Thanks, lelandandbecky! Short and sweet. Too long bores me unless it’s an excerpt from a new book. Asking for our ideas to keep us engaged. If there’s a delay in book release, it’s nice to know that you won’t make the release date, that way we won’t be disappointed or wondering what happened. Ugh. This means I should tell my readers the next book is coming… later. I so hate doing that, though. You can see why this one rarely makes the newsletter! But you’re right, Colleen. It’s important. I just like to be in the know. But I think as the author you know what’s best. I have a question for you readers, do you prefer reading sample chapters directly in the newsletter, or would you be okay with following a link to a website? I am not fond of reading sample chapters, so I prefer a link to the website. Often sample chapters make the newsletter too long and so I skip reading the newsletter. That’s what I think when I see them. Thanks. I like the idea of going to the website. Thanks, Jackie and Renate! I ‘d probably not follow a link even though I enjoy exerpts. I also don’t read sample chapters. They are too long. An exerpt is enough to draw me in (or not). Just a small excerpt, something to wet your appetite. I like this! I like long or short newsletters. I like info on all of the writing processes. Pictures are nice too! I also appreciate knowing when things are being re-released, so i don’t buy it again if I’ve already read it. If I haven’t read it, I look forward to it. Love this, Diana! Out of curiosity, are you a writer as well as a reader? Hi Jackie, I would love to see sample chapters in retired the newsletter. Less clicks always works for me. Interesting! So maybe we should give the reader their choice of how to get that sample? Hi Sally, I like finding out more than about the authors and what inspired them to write certain pieces …their motivation. Sounds good, Rachel! Thanks for sharing that. I think this would be a good tidbit with the announcement of a new release. Thanks, mimionlife. Others have said the same as you, so it’s becoming clear what most of you are looking for. Thanks for the feedback. I love reading your blog and newsletters and like to keep up with the authors. I enjoy reading the newsletters that tell about new releases and how the book was developed. I also agree with others in that I would like to be told if the book has been previously released in a bookset or under a different title. Just recently, I started reading an e-book that I thought sounded interesting to me. I didn’t get too far into it to realize that I had already read it. I did some digging and found that I had read it previously in a boxed set. I think it would be best to have a link to a chapter for a preview so those that don’t want to read the preview can skip it. I enjoy the previews since they usually draw me into the book. This is such a good reminder–I’ll probably be mentioning two of my books in my next newsletter, and they were both first released in a box set. Thanks, Nancy! I love this topic, and can’t wait to read the rest of the responses! It’s already been helpful. It has! With homeschooling this morning, I didn’t have a chance to even pick until a few minutes ago. I was happy to see the number of comments. They’re so helpful. Valerie, I think you asked about this too in a post this year. I don’t think I mentioned then, but I do like how you organize your newsletters. I actually had it in mind when I wrote my post above. It really works for me. I get many newsletters but I enjoy reading them. Although at times I get overwhelmed with so many to read. I love learning about the authors and what their books are about. So keep sending them. I will learn from then when it comes for my time to put one out. Have a great day everyone. Thanks for reading our newsletters. It sounds like you’re a writer too? Valerie’s newsletters are just perfect for her readers, aren’t they? I think that’s the trick; there isn’t one size fits all for authors. A newsletter should probably be tailored to what the author writes and to what the readers really love about that style. Oh, wow, thanks for the shout-out, Margaret! Length (and focus) are the big reasons I went to semi-monthly this year. I’ve got my irons in so many fires it’s hard to keep straight sometimes – for me, as well as my readers. 1. Just a typed up page sent…..small type and I just skip it. WOW!!!! That is a LOT of email. How many of those authors do you actually auto-buy or usually-buy? I’m with Valerie. That’s a huge amount of email to sort through! How do you do it? And can I agree with the hate for the typed email? It never grabs me. Hi Sally! I really like newsletters that tell about new releases, sales, cover reveals, what the author’s working on next, short excerpts, giveaways/contests. I love getting emails from my favorite authors. I love their updates on what books are coming out as well as details about their life they soon become very close friends to me. There are two in particular who I feel like that are like sisters in the Lord. I love hearing all the details that they post, their answers to me when I email them. They are after all my sisters in the Lord we are all part of the same loving family if Jesus Is Our Lord. So even though we have not personally met I love them dearly. Linda, thank you so very much for your comment! This made me take a step back and reevaluate the newsletter. I definitely try my best to write fiction that honors God and challenges the reader, but it’s easy to forget the spiritual aspect when I sit down to do a newsletter. Thank you so much for reminding me and for being such a friend to your authors. Love this so much. I love question and answer formats. I learn a lot more about an author that way. I also enjoy seeing their writing desks and family pictures. The pet pictures could be left out and I wouldn’t mind. I have nothing against pets, I have a five pound 12 yr old Yorkshire terrier myself but some authors over do the pet pictures. I also enjoy the chance to enter to win a new book by an author I’ve never read before. I’ve added several favorite authors to my list that way. Thank you, Gail. I would send a picture of my office, but… My son does homeschool there in the morning so his stuff is scattered around. Plus it’s an unfinished basement. With my other son’s Legos all over the floor behind me. And storage behind that with Nerf guns scattered everywhere for… some sort of effect. I like ones that are full of good information. Maybe what’s going on in their lives, a look at books to come, any signing events or appearances and maybe a current book on sale. But I do not like the emails I get almost daily from authors that just continue to show where I can buy every single one of their books. It’s too much! I agree, pjcbaker. I want to work on making my newsletter more personable. On the other hand, some don’t want that. So I’d like to have some newsletters for the reader who wants to chat and some for the reader who just wants the facts, ma’am. I enjoy receiving newsletters from my favorite authors. I like to keep up to date on upcoming book releases, any speaking events and contests. I enjoy reading about research trips and pictures on their books as well. I also enjoy learning what led them to writing. Thanks so much, Tina! You’re confirming what the others have said. And I love that! You guys are making it clear what you like to hear. I love behind the scenes looks, as well as info about what’s going on in the author’s life. Updates about what’s happening with characters from some of your books would be cool too. Awesome post, Sally! Thanks for asking an important question. I learned a lot by reading the responses. You guys have all been so awesome! Keep the comments coming, though, even if someone else already said what you were going to say. That helps us know what you really want and don’t want. Sally, thanks for the great question. I’ll keep the comments in mind when I send out my next newsletter. I’m glad it’s been helpful, Merrillee. I enjoy reading newsletters from authors. I like the ones best that are fairly short with book news, interesting information and maybe some pictures. I think twice a month is usually plenty, unless there is something very exciting to report on. If the newsletters are really long, I usually skip over most of it. No one really seems to be a fan of long! Thanks, Winnie! I enjoy info on when books are coming out. I also like reading about back stories. And like most of the responses, I don’t like long newsletters. It they are too long, I probably won’t read to the end. Great info, Marcia. Thank you! I’m not sure I’m a good one to be answering this question. My email has been overrun by author newsletters. Because it’s the Lenten season, I’ve been paring down the number of newsletters in my inbox by unsubscribing. I have some pet peeves: 1) Because I get SO many newsletters, I don’t read sample chapters. I don’t have time and if I’m really interested, I can usually get a sample on Kindle. 2) Whenever a newsletter begins with “You guys! !”, I tune out. 99% of the authors I’m following are women writing books that are mainly read by women. I realize “You guys!” is a regional greeting like “Howdy y’all!”, but I would rather see that. I’m a lady. I’m Southern. It fits. 3) I only need a monthly update. Most of the authors I subscribe to are also posting DAILY on Facebook. The newsletters are almost redundant. Some, not all, have a monthly giveaway for subscribers–not why I subscribe. I enjoy most of all getting something out of the newsletter that helps me feel a connection to the author and her/his writing. Just keep it short and simple (not a cluttered layout). I through being picky now. JJ, that was great! You weren’t picky at all. And as a Chicagoan, I am so likely to say you guys because that’s our version of y’all. :) So I will make sure to not open any newsletters with that. Thank you! I love getting newsletters from authors. I mainly like to read about upcoming books and maybe a little excerpt. I enjoy reading what the authors days are like and getting to know them better. I do like a brief newsletter once a month unless the author has something they want to let readers know about . Thank you, Deana. That’s great info. I need to work on being more open with my readers, but my husband doesn’t really like me sharing anything about our family. So that’s a fine line to walk for me. I like when the Authors tell me about their lifes, family and animals. I like to know what they are working on and fun things about that, and new releases and who they read and why! I don’t like the whole page being all about every single book they write. I will look it up as long as link is provided. 1) Make me feel special. Most authors are active on social media and share book info and daily updates on Facebook. I like newsletters that tell me something about the author/author’s books that they don’t share anywhere else, like the inspiration for the book that’s releasing next month, or some insight into their writing life they haven’t blogged about. If the newsletter contains a repeat of info I can get elsewhere, why subscribe? 2) The second thing is pictures! When I see a screen full of unbroken text, I’m ready to move on to my next email. I also agree with many of the comments here about excerpts; I’d rather see a link to an excerpt on your blog or Kindle page. Do you know, with all the author newsletters I subscribe to, you’re the first author I’ve seen ask this question? Thanks for the chance to give feedback, Sally!